Shatkarma are cleansing techniques (shuddhi kriyas). They are recommended to be done to prepare the body for yoga practices. They are named shatkarma because they are six (shat in Sanskrit) in number. In simplest words: these techniques are done to clean ingestion, digestion and excretory system of our body. These systems mean eyes, respiratory system, digestive system & excretory system. Just like when we take bath, we remove dead skin cells and other pollutants from our skin, shatkarma works on cleaning inside of our body. In yogic view, the process of shatkarma is done to remove unnecessary particulates from our body and make it light & energetic. Moreover, when our body is light it helps us to practice asana and pranayama in the better way, making them more effective. Shatkarma are discussed both in Gheranda Samhita & Hatha Pradipika. The prominently mentioned in Gheranda Samhita as first step. In Gherand Samhita, the human body ( including mind) is mentioned as Ghata. And thus the process of cleansing the body and mind is mentioned as ghata shuddhi. Note: You must have heard the word Shat Kriyas too. 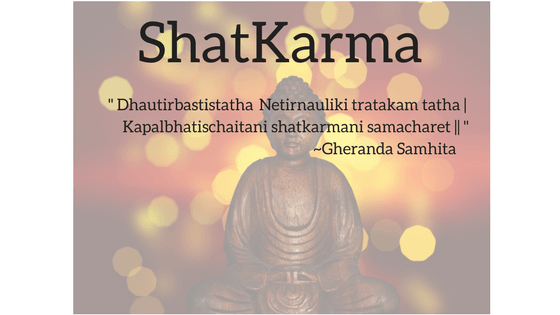 This is Hindi translation of the Sanskrit word shatkarma. Karma, when translated to Hindi, becomes kriya. An important thing to note here is that the sequence of ShatKarmas are mentioned differently in both hatha pradipika and gheranda samhita. Hence I have mentioned both of them separately. Gheranda Samhita: Maharishi Gheranda has mentioned about Shatkarma as the first limb of Yoga. He mentioned in the Samhita that without shatkarma practice, no practitioner can achieve success in Yoga. As per Maharishi Gheranda, First and foremost in the practice of Yoga is cleansing and purification of our body. Without it, the progress in other limbs of Yoga will be difficult for all. Thus he has accepted it as the first step of Yoga. Hath Pradipika: Swami Swatmarama (author of Hatha Pradipika) has a different view with regards to Shatkarma. He has recommended these techniques only to those practitioners, who have excess fat & Kapha in their body. For others, Swami Swatmarama mentioned shatkarma as an optional practice. So basically, the difference is in the sequence of fourth and fifth practice. Though Shatkarma are called cleansing techniques or shuddhi kriyas, in Yoga, they are valued for little more than that. Bring balance to mind & body processes. Balance prana flow in Ida and Pingala Nadi. From there to stimulate the flow through Sushumna Nadi. To remove/ excrete toxins from our body. To cleanse our body from inside & keep our body healthy. Providing strength to our internal systems like blood circulation, digestion, respiratory system & immunity. All the shatkarma mentioned here are best learned under expert guidance and in a proper environment. What I have listed here are common benefits, precautions & contraindications only. It is to be used as a reference article for your knowledge about Shatkarmas. Learning from a teacher is the best way to extract maximum benefits out of these practices and to avoid any unintentional harm. Trataka is gazing based technique for eyes. In this cleansing technique, you place a light source like a candle at arm’s length from yourself. Then look at the tip of the flame without blinking your eyes till your tears start to flow. Contraindications: Not recommended for people suffering from depression. Low BP people are also asked to avoid it. Benefits: A clean nasal passage, especially in city’s air condition is something of a boon these days. Plus, you are able to breathe fuller with each breath when you nasal passage is clean. This takes care of cold, flu etc. too. Contraindications: The salt in the water is contraindicated for heart patients. This practice is also contraindicated in case of cold or flu. Sutra neti is not recommended when you have stuffed nose, sensitive mucus or some issue with central bone of the nose. Kapala means ‘skull’ & Bhati means ‘shining’, thus the complete meaning of kapalabhati is shining skull. This meaning is derived from benefits given by regular practice of Kapalabhati. Benefits: As kapalabhati is active exhalation followed by passive inhalation, it helps in cleaning out the respiratory system. Moreover, this helps in improving capacity of your lungs. Contraindications: Not to be done by epilepsy patients, asthma patients and high BP patients. Dhauti is the cleansing technique for the upper area of food pipe, up to stomach area. This helps in improving and keeping the digestive system healthy. Benefits: Dhauti has the benefit of cleaning the digestive tract of lingering food particles, extra mucus. It also helps in removing the problems of gas, acidity & indigestion. Contraindications: Not be practised in case there is an internal injury or sensitivity in the digestive tract or stomach like an ulcer. Nauli is churning of abdominal muscles to clean stomach and small intestine. This is one of the difficult techniques to master. It requires control of abdominal muscles. Though, when you are able to do it, it is very beneficial practice. Nauli helps in massaging the abdominal muscles, thus strengthening the abdominal walls. Benefits: Nauli benefits in strengthening the muscles structure of and around the abdominal area. As an additional effect, Nauli also helps in regulating blood pressure. Hatha Pradipika mentions Nauli to be very beneficial for digestive system & related issues with indigestion. Contraindications: Quite frankly, don’t practice Nauli if you have any sensitivity or issue in your abdominal area. This is a strong practice and requires the presence of an experienced teacher to learn properly. Basti helps in cleaning out large intestine. The water which is pulled or pushed (in enema) churns around in large intestine and makes passage smooth for undigested food. Benefits: Basti helps in indigestion, gastric troubles among other issues related to the large intestine. Those with the sedentary lifestyle and digestive issues can get a lot of help with Basti. The enema is one of the main treatment therapies used in Ayurveda and even by Medical Science as Enema. Contraindications: Acute diarrhoea, Hemorrhoids or rectal polyps etc are some extreme cases as well as sometimes shortness of breath is also mentioned as a contraindication for the practice of Basti. How and Why to learn about Shatkarma? Shatkarma are first step in first rule of Niyama which is Saucha. Yoga offers a lot as the way of life. You don’t need to follow all of that to realise the benefits of different practices of Yoga. As I have heard from many senior teachers of Yoga, people enter into yoga hall from different doors (reasons), and slowly they explore what all that hall has to offer. Similarly, you can be here only for body health reasons. By all means, it is good enough reason to have. Shatkarma prepares your body for getting maximum benefits out of Asana and Pranayama practices. The best way to learn about Shatkarma is to learn under the guidance of a qualified experienced teacher. The simple reason is that though there are guidelines available in the books, they are not applied as copycats in the real life. They require adjustments to the students capacity, which only an experienced teacher can do. Hi, I was trying to find out if shatkarma is compulsory for everyone and happened to chance upon this website. Thank you for the information. I now understand that there are two schools of thought. So, I guess it is safe for me to go ahead with shatkarma practices. I read somewhere that people with certain body constitution should not practice shatkarmas. Yes, it is safe for you to go ahead with shatkarma practices. What you need to be careful about is to learn and begin the practice in the guidance of an experienced teacher. The contra indications about shatkarma are clearly mentioned and most of experienced teachers know about it. So, the doubt body composition will be taken care of. More over, stay observant about your body during practice and you will know better.